Nearly every parent loses control and screams at the children now and then. But what if you do it repeatedly? Researchers suspect parents are yelling more. 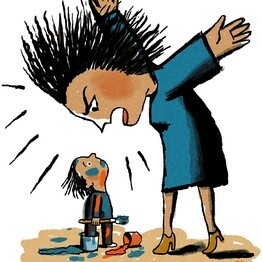 Parents have been conditioned to avoid spanking, so they vent their anger and frustration by shouting instead. Three out of four parents yell, scream or shout at their children or teens about once a month, on average, for misbehaving or making them angry, research shows. Increasingly, therapists and parenting experts are homing in on how it hurts a child, as well as how to stop it. Yelling becomes damaging when it is a personal attack, belittling or blaming a child with statements such as “Why can’t you ever remember?” or, “You always get this wrong!” Ms. Faber says. 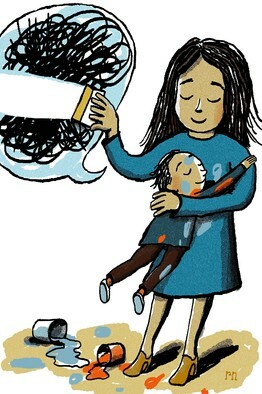 Many parents lose control because they take children’s misbehavior or rebellion personally, research shows: They feel attacked or think the child’s actions reflect poorly on them. Parents who see a child’s negative emotions as unexpected, overwhelming and upsetting tend to feel more threatened and frustrated with each new outburst, says a study published earlier this month in the Journal of Family Psychology. This pattern, called “emotional flooding,” triggers a downward spiral in the relationship, disrupting the parent’s problem-solving ability and fueling emotional reactions, such as yelling. Teens whose parents use “harsh verbal discipline” such as shouting or insults are more likely to have behavior problems and depression symptoms, says a recent study of 976 middle-class adolescents and their parents, published online last September and led by Ming-Te Wang, an assistant professor of psychology and education at the University of Pittsburgh. Another study suggests yelling at children may have consequences that go beyond those of spanking. Eight-year-olds whose parents disciplined them by yelling have less satisfying relationships with romantic partners and spouses at age 23, according to a 15-year study led by Stephanie Parade, an assistant professor of psychiatry and human behavior at Brown University. “Parents who yell may miss out on a chance to teach children to regulate their emotions,” she says. Spanking also predicted less satisfying adult relationships, but the negative effects were offset when parents praised their children at other times. The negative effects of yelling weren’t erased by parental warmth, however. The negative problem-solving tactics that children learn when their parents yell may stick with them as adults, says the study, published in 2012 in Marriage & Family Review. Children also may expect others to treat them in a negative way, and unconsciously pick partners who fulfill that expectation. “Yelling is where 90% of us do the most damage,” says Julie Ann Barnhill, a speaker and author of “She’s Gonna Blow,” a book on parental anger that has sold 135,000 copies. Ms. Barnhill says she used to yell one to three times a week at her children when they were preschoolers. She got counseling, and learned to control her anger and discipline her kids in calmer, more positive ways, techniques she now teaches other parents in speeches and workshops. Parents can learn to notice signs that a blowup is brewing and dial down their own tension. Warning signs can include: tightness in the throat or chest, shallow or rapid breathing, a clenching of the teeth or jaw, negative thoughts about oneself or feelings of being overwhelmed. Many parents blow up because they have unrealistic expectations—such as assuming a two-year-old shouldn’t push parental limits, says Ms. Savage, chief executive of Hearts at Home, a Normal, Ill., nonprofit that runs conferences on parenting issues, including discipline. “We say to our children, ‘Act your age,’ and in reality, they are,” she says. Not expecting children to be perfect, or nearly so, can calm parents’ frustrations, Ms. Savage says. So can seeing a child’s failure as an opportunity for him to learn. Parents can turn a meltdown into a teaching moment by involving kids in finding solutions, Ms. Faber says. She suggests waiting for a calm moment and stating the rule the child violated. Then give the child a choice about how to prevent the misbehavior from happening again. Inviting a child to suggest solutions teaches problem-solving skills. Sara Weingot of Baltimore used the technique after her 6-year-old son misbehaved during an outing in her minivan, kicking and pushing two other kids’ booster seats. She later told him she never wanted it to happen again, then listened sympathetically as he explained that he had been squeezed too tightly between two other kids’ car seats. Ms. Weingot gave him a choice between staying home with a babysitter next time and finding another solution. He made a list from “get a better car” to taking turns with his siblings in more comfortable seats, an idea that worked, Ms. Weingot says. Apologizing can help repair a relationship after an outburst, says Ms. Barnhill, the author. She took her daughter aside in her teens and apologized for an explosive incident a few years earlier. “I have this memory of being in your face and yelling at you. I am so sorry, sweet girl,” Ms. Barnhill says she told her. Her daughter Kristen Draughan, who is now 25, married and studying for a master’s degree in social work, says she doesn’t remember her mother yelling much when she was a child. But Ms. Draughan does recall that her mother’s remorse made her burst into tears. “It showed that she cared about my feelings,” she says. April 18, 2017 in Parents/Kids & Psycho.